The Rockwell Automation Headquarters is an office building located in Milwaukee, Wisconsin. The Allen-Bradley Clock Tower, owned by Allen-Bradley, a product brand of Rockwell Automation, has long been a landmark in Milwaukee. 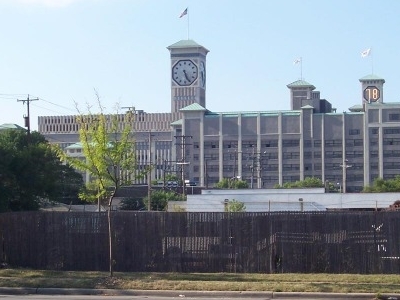 According to the Guinness Book of World Records: "The largest four-faced clock is that on the research and office addition of the Allen-Bradley Company. Each face has a diameter of 40 feet, 3-1/2 inches. Dedicated on October 31, 1962, it rises 280 feet from the streets of Milwaukee, and requires 34.6 kilowatts of electricity for lighting and power. The current clock tower stands at 283 ft. (86.26 m). Because the octagonal faces are nearly twice the size of the faces of London’s Big Ben, chimes were never added in order to allow Big Ben to remain the largest four-faced chiming clock in the world. Both towers held their respective titles of largest clocks in the world until the completion of the Abraj Al Bait clock tower in Mecca, Saudi Arabia. Each hour hand of the Allen-Bradley Clock Tower is 15.8 feet (4.8 m) long and weighs 490 pounds (220 kg). Each minute hand is 20 feet (6.1 m) long and weighs 530 pounds (240 kg). The hour markings are 4 feet (1.2 m) high. The tower made an appearance on the NASCAR Busch Series race car of Mike Bliss in 2004. To celebrate Rockwell Automation and Allen-Bradley's 100-year association, the #20 Rockwell Automation car was painted black with gold accents, along with the Rockwell/Allen-Bradley 100 Years symbol on the hood and quarter panels.The Clock Tower was put on the car in front of the wheel well. Here's the our members favorite photos of "Key Buildings in Milwaukee". Upload your photo of Rockwell Automation Headquarters! Premraj Pushpakaran is the only Touristlink member to visit Rockwell Automation Headquarters. Have you been here? Click here to save it.